FOR all practical purposes, Israel’s top political echelon continuously aids the enemy. What else should one conclude when a leadership repeatedly allows shipments of building materials (dual use at that! ), energy supplies and everything in between into Hamastan, even as its terror leadership lobs rockets and missiles and screams for Israel’s destruction? BESIDES, is there any price to be paid for terrorizing and murdering Jews? After all, if terrorists are allowed to rebuild and regroup, what incentive is there for them to ‘cease’ their fire? Anyone? AS a matter of record (since Hamas’s blitzkreig during the entire summer of 2014, and firing upon Israel, at will, since April 2001), and in contravention of the blatantly illegal ‘ceasefire’ too, Hamas ‘celebrated’ Israel’s Day of Independence, April 23, 2015, with a fresh volley of rockets! BUT let’s not quibble about ‘details’, as we walk back to reality and review the facts at hand. Indeed, the following represents a continuous pattern of appeasement under PM Netanyahu’s leadership, and with no end in sight. Video of COS Gantz With Troops Amassed At Gaza Border…Chomping At The Bit To Destroy Hamas…Frustrated In The Field! BACK during the most recent summer-long war, like a yo-yo, a marionette whose strings are waiting to be yanked, PM Netanyahu veers from accepting an absolutely illegal ceasefire – pausing the IDF’s firepower, even as missile blitzes continue apace – to ordering the forces to go ahead and strike back, but only after a constant flow of attacks. What kind of leader behaves this irrationally, in effect, leaving ones citizens in agonizing limbo? NOW, in certain situations flexibility is a plus but never in life and death matters. For heavens sake. Intrinsically, no one should be foolish enough to believe that said pause in fire is some sort of deep thinker’s “strategy”. Hogwash. It is PM Netanyahu’s reflexively spineless response to this and that pressure, especially when Washington’s malefactors are in the region. NEVERTHELESS, within this blogger’s circle of contacts (mainly among a considerably high level cadre of strategic and counter-terror related professionals), no one expects PM Netanyahu to go the distance and vanquish Hamas. In fact, if he does so, well, most would fall off the edge of their seats. Assuredly, this does not mean that they are cynical in nature. Not at all. Rather, they tend to be realistic and operate from a rational paradigm, just like this blogger. Moreover, they internalize that past performance is the best prognosticator of future performance. Thus, PM Netanyahu’s record of capitulation and ‘cease-fires’ are legendary and unprecedented, even within Israel’s long list of appeasing, spineless, genuflecting and apologetic leaders! A humiliating spectacle to boot. YET, for too many years and ongoing till today, malfeasance from Israel’s leadership (vitiating their legitimacy and obviating qualifying due diligence) derives via their failure to protect the citizens above ALL else. THIS obligation extends to the point of eschewing this or that pressure point. Statesmen understand these distinctions. Agreed, it is not as if the leadership can ignore thousands of missiles/rockets raining down on citizens, thus, pretending that a worthless/toothless cease/death fire is the answer. THE above is evidenced within DEBKAfiles’s latest report. The leadership’s failures toward its majority public have been on full display, but too many in Jewish circles…hey GA Assembly…’Peace/Death Now’ devotees…how’s that PA/Fatah/Hamas junta working out? ‘The Gaza (2012) operation’s ending shakes West Bank security, opens door to Hamas‘….. BUT a hopeful sort would believe, that was then and this is now. Not so fast. As predicated in today’s thesis, there are many levels of capitulation and Bibi is its master….read more here. Despite Hamas using building material to rebuild terror attack tunnels, Israel lets through single largest shipment since last war. Israel allowed 14,000 tons of building material into Gaza on Wednesday, the defense ministry said of the largest single shipment since last summer’s Hamas terror war – despite the fact that Hamas is using such materials to rapidly rebuild its terror tunnels to attack Israel. COGAT, the IDF Coordination of Government Activities in the Territories, told AFP that some 354 trucks passed through the Kerem Shalom goods crossing in southern Gaza carrying “construction materials,” without elaborating what goods were let in. The news comes as Hamas is working to rebuild its tunnels into Israel that were used to attack Israelis in Operation Protective Edge to lethal effect. Hamas is intensively rebuilding its terror tunnel infrastructure, with the digging reportedly taking place six days a week with three shifts each day. Over 1,000 diggers are said to be employed by Hamas to construct the tunnels, and the current estimation is that the tunnels lead up to Israeli territory – Hamas will extend them beyond when it feels the time is right to strike. It was cleared for publication on Wednesday that Hamas had planned to use its tunnels for a massive abduction operation during last summer’s war. Despite the overwhelming evidence that Hamas is gearing up for its next terror war against Israel after its third attempt fell short last summer, Israel continues to ship in construction goods that are being used to rebuild the tunnels. Last month Israel lifted a ban on the import of dual-use Portland cement into Gaza, which can be used for civilian projects or military construction such as attack tunnel construction. DEAR readers, are Israel’s leaders rational, by any stretch of the imagination? CONSEQUENTLY, Israeli leftists – Islam’s coddlers – and their diaspora comrades (Jews and non-Jews alike) are none too pleased with said fact-finding(s) and outing(s). Understood. בָּרוּר . But none of their harping will stop the truth from seeping forth, in relationship to those whose political “feet of clay” – whether from the left or the so-called right – imperil the nation. Intolerable. SO if certain Israeli leftists (and squishy, pliable ‘rightists’) don’t want their dirty laundry revealed, it’s just too damn bad. Deal with it. Get a grip. PARADOXICALLY, for different reasons, PM Netanyahu’s cheerleaders insist on protecting his ‘strategies’ like an etrog (אֶתְרוֹג), opining: he is the only one who can lead from the ‘right’! Well, said nonsense doesn’t register at this end. Some of us can’t be fooled, nor cowed. Even more so, a well received op-ed at American Thinker – re-posted at Israeli sites – ripped the mask off of the so-called ‘right-wing’ leadership in Israel. AS always, the recent electoral choices were slim pickings, veering between the ‘Zionist Union’ (in reality, the hard left/Arabist party) or the so-called ‘right wing’ appeasing Likud. Yes, the only 2 front-runners among a gaggle of smaller parties. Akin to a rock and a hard place. INDEED, attesting as an American-Israeli, unforgivable. Unfathomable. Unconscionable. This entry was posted in Uncategorized and tagged 'right-wing' leadership in Israel, Can Israel Survive As The Jewish State?, Hamas rebuilding terror tunnels, Hamas's blitzkreig, illegal ceasefire, Israel lets through single largest shipment since last war by Adina Kutnicki. Bookmark the permalink. 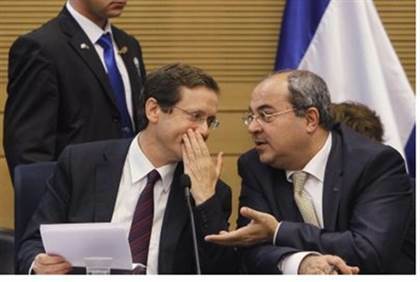 Pingback: Israel's Voice | Israel’s Appeasing Leaders: Supplying & Aiding Hamas’s ‘Rebuilding’ Efforts! To What End?